Wall Street hates the Volcker Rule and expectations have been building that the Trump administration would kill it. But Steven Mnuchin, President-elect Trump's pick for treasury secretary, signaled on Thursday that the Volcker Rule isn't on the chopping block, at least not completely. "I do support the Volcker Rule," Mnuchin said during his confirmation hearing in the U.S. Senate. The post-crisis rule bans big banks like JPMorgan Chase (JPM), Citigroup (C) and Goldman Sachs (GS) from making risky bets with their own money -- actions that some say exacerbated the financial crisis. Mnuchin said he didn't believe risky trading belongs in banks that require FDIC insurance. However, Mnuchin sounded concerned about unintended consequences of the rule, which is named after former Federal Reserve Chairman Paul Volcker. Mnuchin, a former Goldman Sachs banker, flagged a recent Fed paper that found the 2015 implementation of the Volcker Rule had a harmful effect on the ability to easily buy and sell bonds during times of stress. Without that liquidity, markets can get jammed up. "That is something I absolutely would look at," Mnuchin said. Trump's pick for treasury blamed an overly-complex interpretation of the Volcker Rule that has left Wall Street confused and handcuffed about their abilities to provide liquidity. Making bets or trading with their own money is known in Wall Street as proprietary trading. "We need to be able to explain to banks what's proprietary trading -- and what's not proprietary trading," Mnuchin said. Related: Wall Street hates the Volcker Rule. Will Trump kill it? 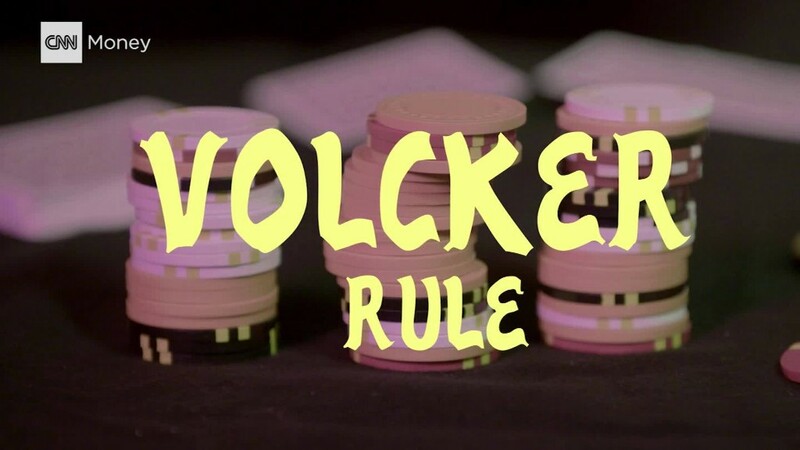 Powerful Republican leaders had been pushing to kill the Volcker Rule. The Financial Choice Act, a bill championed by House Financial Services Chairman Jeb Hensarling, calls for repealing the rule entirely. Mnuchin's testimony to Congress suggests the Trump administration will relax -- but not completely eliminate -- some regulation. For instance, Mnuchin said he thinks the Consumer Financial Protection Bureau, the watchdog championed by Elizabeth Warren, is worth keeping. However, Mnuchin said he believes the CFPB should be funded by Congress, not the Federal Reserve as it currently is. CFPB supporters would push back against such a shift. Their argument is that it would hurt the agency's independence and could allow Republicans to starve it of funding. Yet Mnuchin didn't give big banks much love, especially not compared with Main Street banks. "My biggest concern is this regulation is killing community banks," Mnuchin said, adding that tiny lenders provide much-needed loans to small businesses. Mnuchin also said he wants to make sure "we don't end up in a world where we only have four big banks." Trump's treasury pick was asked about bringing back the Glass-Steagall Act. Last summer the official Republican platform called for a return of this Great Depression-era law that restricted banks from serving both Wall Street and Main Street. The law was repealed in 1999 under President Clinton. "I don't support going back to Glass-Steagall as is," Mnuchin said. He explained that Glass-Steagall is a "very old law" and implementing it now "would have very big implications to liquidity and capital markets." Still, Mnuchin said there's a need for a "21st Century Glass-Steagall." He didn't elaborate exactly what that would look like.